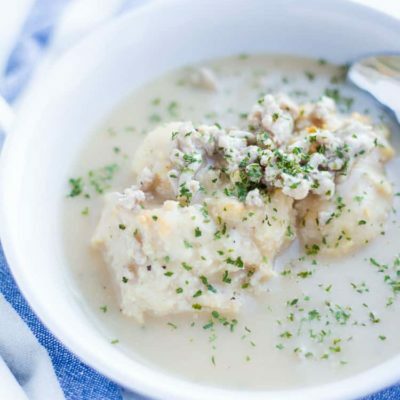 Biscuits and Gravy recipe warming your soul this winter. It is an easy all-around comfort food the family will love. 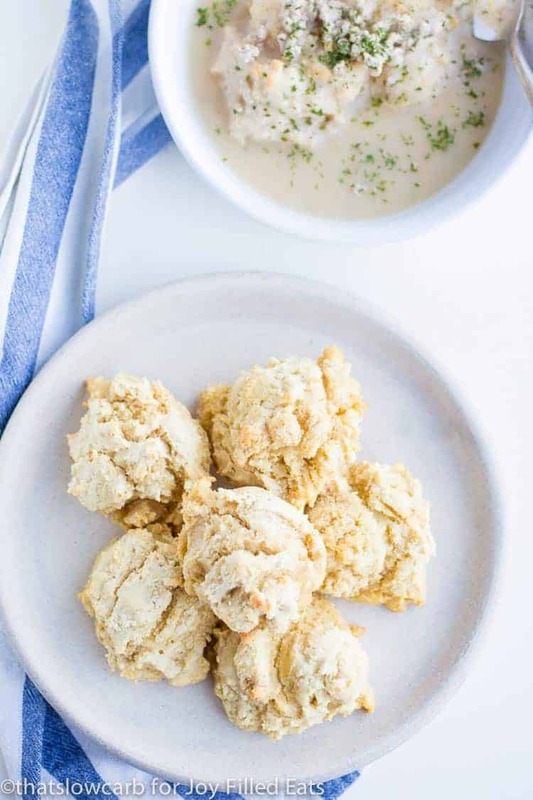 Made in about 30 minutes this Almond Flour Biscuits and Gravy Recipe is a quick weeknight dinner or a hearty side dish. Hiya everyone! 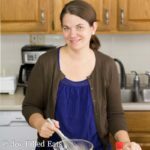 This is Lindsay again from over at That’s Low Carb and today we are bringing you a family favorite and a recipe my husband goes ga-ga over, Biscuits and Gravy! This is a recipe that we haven’t made in a while. Not sure if it’s the crisp mornings or the fireplace roaring that has me craving comfort foods but we are craving some comfort foods! Our unstuffed cabbage soup is RIGHT up there with these cravings. Let’s start with the low carb biscuits. There are quite a few options of biscuits you can choose from. Just depending on what you have on hand. 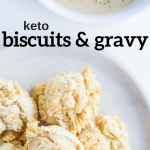 My favorite personally is our Keto and Low Carb Biscuits. Simply drop on the pan and bake. So easy. 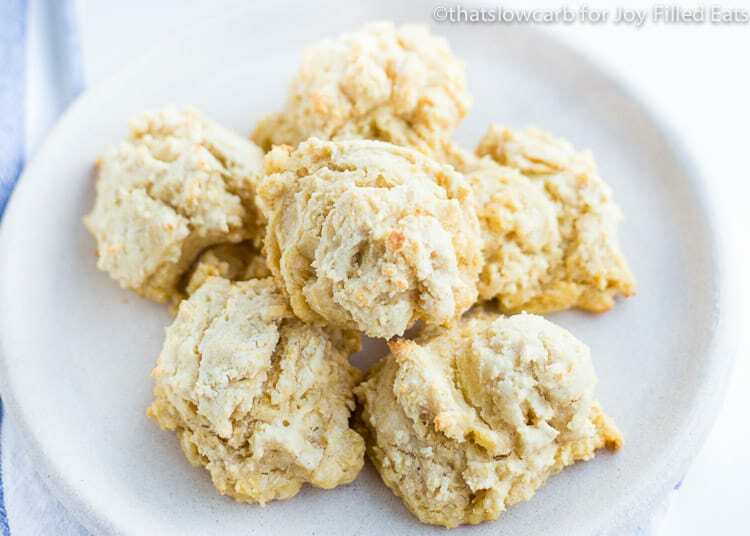 These Almond Flour Keto Biscuits from Taryn here at Joy Filled Eats are also perfection, simply omit the extra herbs. 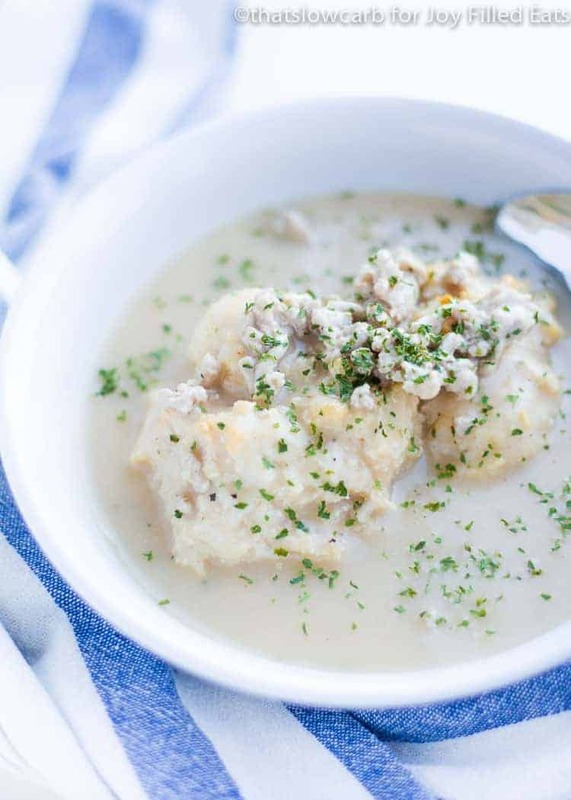 We used these biscuits for this biscuits and gravy recipe! Low Carb Garlic Rosemary Rolls if you want some proper rolls instead of the drop biscuit style. After you pop the biscuits in the oven next is our gravy. Perhaps why I enjoy this recipe so much. There is about 30 minutes total of work. While the biscuits are baking you’ll start making the gravy. Brown your sausage (or ground pork works well). Once it is cooked set it aside in a separate container. Then begin making the gravy with your basic stock, xanthan gum and some spices. You’ll want to deglaze the pan by adding your stock and scraping the bits and flavor that might have been cooked on with the sausage. Get ALL those extra tasty bites into our gravy. 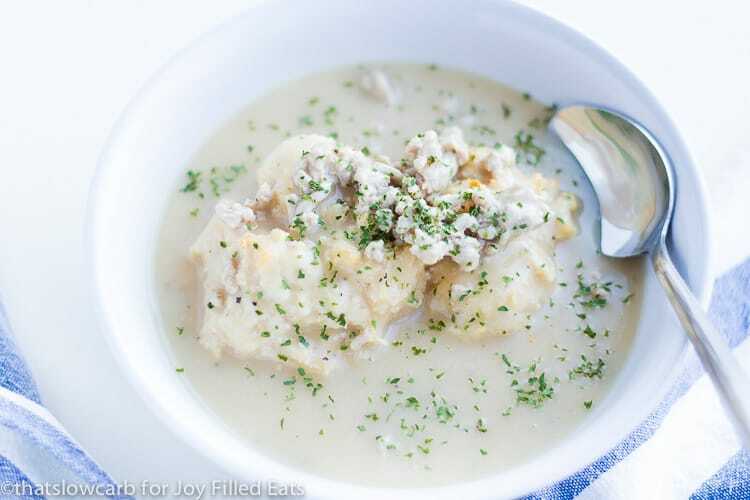 Spoon your gravy on top of some warm biscuits and we’ve got Biscuits and Gravy! Warm comforting food that will take the chill out of your body and keep you warm this winter. Enjoy! Combine all biscuit ingredients together (except the mozzarella). Mix until smooth, then gently fold in the mozzarella. Drop 12 biscuits onto a prepared baking sheet. Bake for 25-30 minutes or until golden brown. In a large saucepan over medium heat, cook ground pork until it is no longer pink, season with a little salt and pepper and set aside in a separate bowl. Pour in your beef stock, deglaze the bottom of the pan and allow stock to reach a boil. Take about 1/4 cup of the stock and place into a small bowl or glass, whisk in the xanthan gum. Slowly pour the xanthan gum slurry mixture back into the stock, continually whisking the entire time. (NOTE: You may want to use a little more or little less of the xanthan gum to reach your desired gravy thickness). 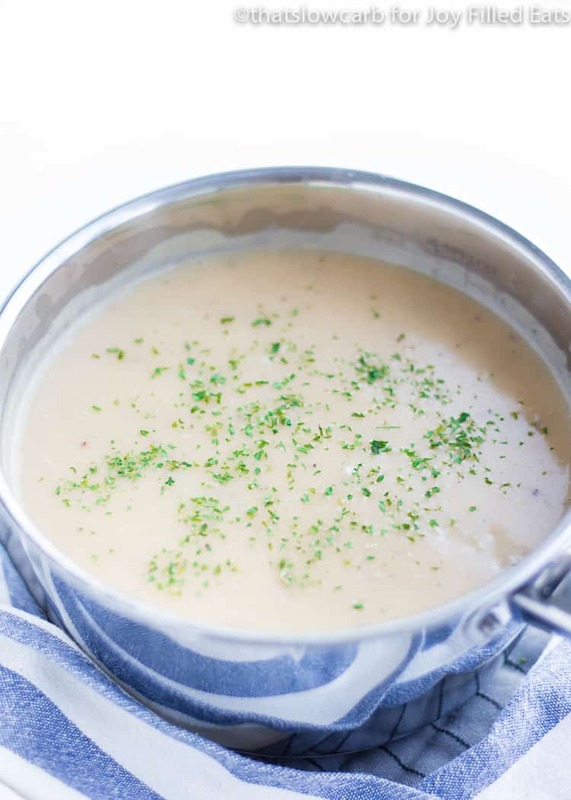 Allow 3-4 minutes on a medium heat to see if desired gravy thickness is achieved. Set to a low heat, stir in cream, garlic powder, pepper and salt. Stir until well combined and serve over your freshly baked biscuits. 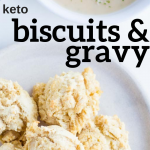 Just curious, how many carbs per biscuit without gravy? 4 total carbs, 3 net carbs. I think 2 or 3 as a meal would be ok. I'd probably lean towards 2 with a side salad.